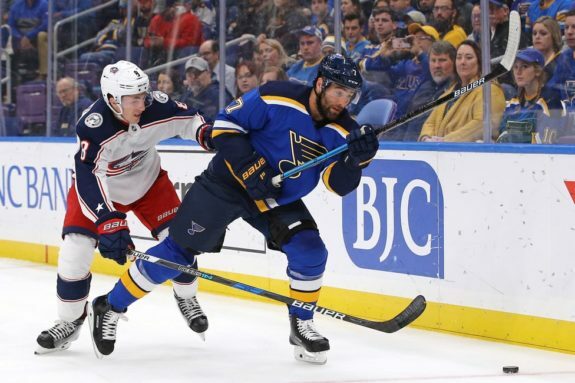 When Patrick Maroon signed a one-year deal in the offseason with his hometown team, the St. Louis Blues, the hype was understandably significant. Fans were excited to see a local kid return home to the team he grew up rooting for, and it was an added bonus that they believed he might be the final piece in a Stanley Cup winning puzzle. As with so much else in the Blues’ season, Maroon’s campaign didn’t get started as planned. He had eight points in his first 25 games, and looked even worse than those numbers suggest. It caused us to question whether he would be able to turn his season around. Lately, he has been answering that question with a resounding “yes.” The man affectionately known as “the Big Rig” is starting to live up to his name, and is giving his fellow St. Louisans big playoff dreams. Maroon’s season was utterly forgettable until the month of March. Through February, he had just 16 points, despite playing 55 games. He was minus-14 through December, though he improved slightly to minus-nine by March 1, due in large part to the team’s turnaround. Then something special happened: Maroon found new linemates, and he found a whole new groove. When united with Tyler Bozak and Blues rookie sensation Robert Thomas, he began to find his stride. The group was first joined on Dec. 11, but were not consistently played together until more recently. While working with Thomas and Bozak, Maroon has scored nine of his 24 points and, more importantly, six of his nine goals. In March, he has 20 shots, is a plus-four, and is averaging 14:44 per night, his highest total since October. Maroon is at his hottest right now. He has a goal in each of his last four games, the longest such streak of his career, and in those games, he has 13 hits. 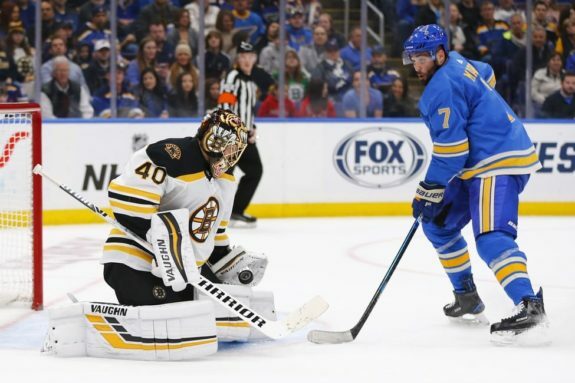 The team is 3-0-1 in his streak, and there’s no question that his combination of scoring and physicality, exactly the traits the Blues signed him for, have been big factors. In that stretch, Maroon also collected his 200th career point, becoming the first player both born and raised in St. Louis to accomplish that feat. With a deeper look at the numbers, a great March for Maroon is no surprise. It’s been the best month of his career by far. In the month of March, he has 55 points in 83 games, far above his next closest month of 35 points in 64 games in January. This was especially true last season when, after Maroon was dealt to the New Jersey Devils at the trade deadline, he proceeded to collect 13 points in 17 games in March and April. It’s the second time he’s undergone a transformation after a deadline deal, as he posted similar numbers with the Edmonton Oilers when he was traded there by the Anaheim Ducks in the 2015-16 season. This season, though, Maroon did not need a move to jump start his performance. All he needed was a little patience and some new linemates. It is also possible, though he has not admitted it publicly, that it took him until recently to feel 100 percent after significant offseason back surgery. Teammate Vladimir Tarasenko quietly confessed that his poor start was due in part to recovering from his shoulder surgery; perhaps the team kept the same lid on Maroon’s health, as well. The only question that remains for Maroon or for the Blues is how they will perform in the playoffs. If his history anything to judge by, he should do well there. Maroon has 27 points in 47 career playoff games, and has averaged over 16 minutes per night. He also has 128 hits in those games. That mixture of scoring and aggression is exactly what the Blues need from Maroon, and it’s what he’s finally starting to show. The future is uncertain, as he will become an unrestricted free agent when the season comes to an end. But whether the Blues consider an extension or not, there’s still plenty of time for the team and the hometown kid to make memories together.